A guy shot this at my place Sunday about an hour after dark on a night stalk. 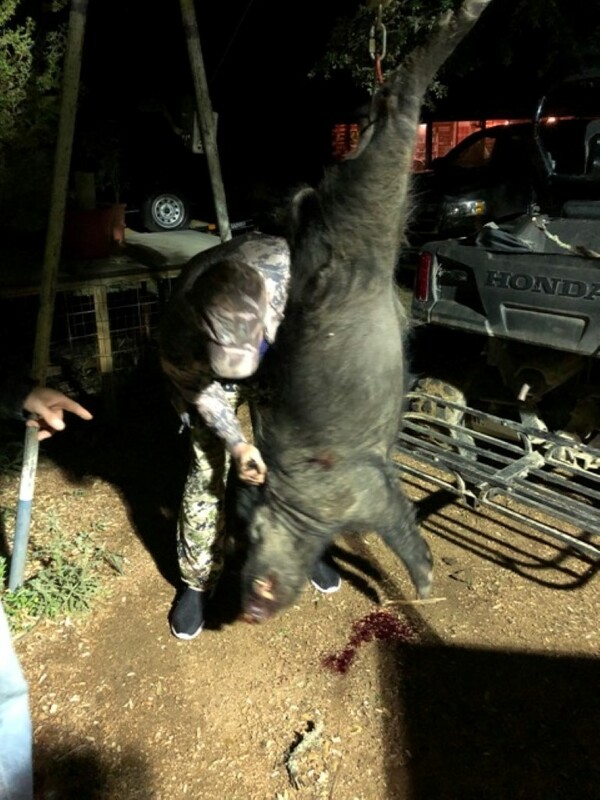 Was the meanest looking hog I've ever seen. That is one nasty hog!! But, worthy of a wall mount for sure! Beast! Ice brine him for a couple of days and throw him on the pit this weekend! Congrats! Big ole nasty for sure. Big Ugly for sure! Congrats to him. Nasty looking hog there. Congrats to the hunter! Congrats, but like everyone has stated... He's an ugly one. That's a Big un. Well done sir. 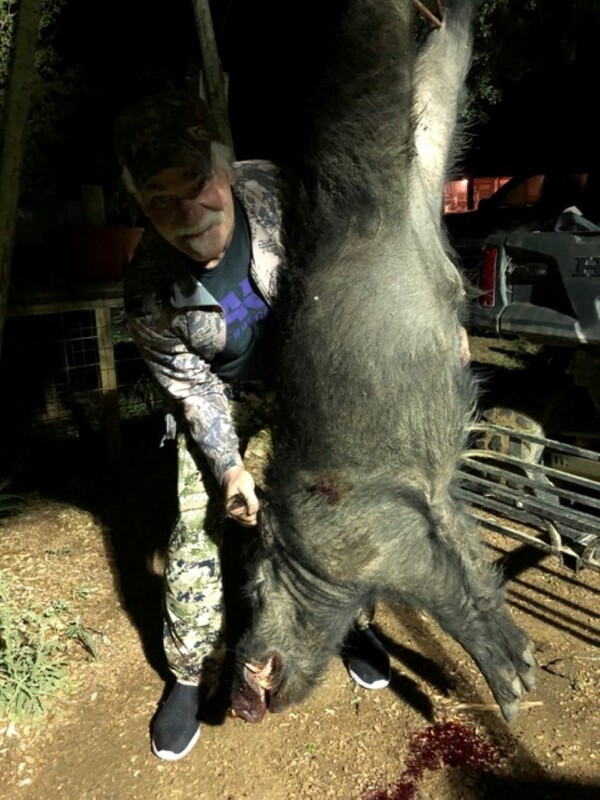 That's a good size hog, congrats. Congrats on a good kill! 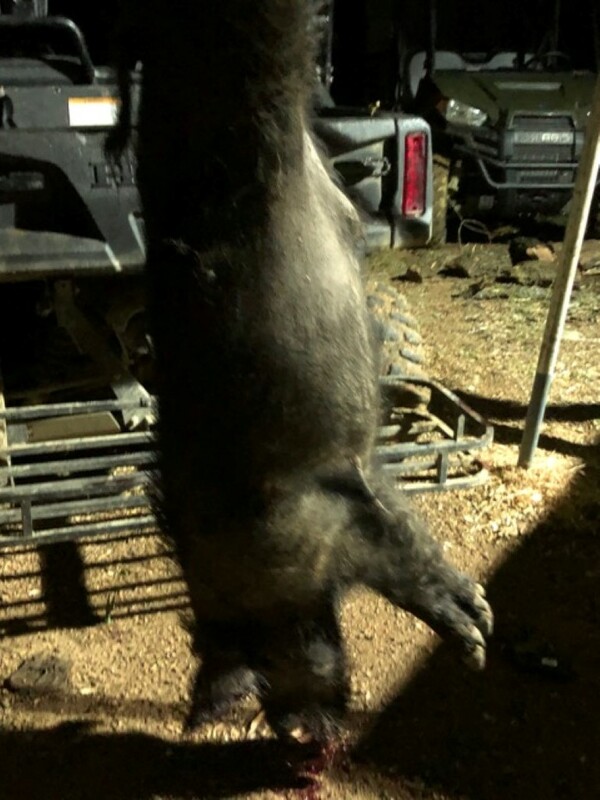 Kevin (the big hog shooter) made it back home to New York. He had the hog meat brined on ice for 7ish days. He sent me this picture and text. "Texas wild boar Georgia barbecue with rice and beans - It is quite good"
After he shot it I figured it would stink. But after loading it, taking pictures, and weighting it and everyone noticed it had zero odor and no fleas or ticks we thought it may be good. Apparently it was. Who in the hail took those sorry arse pitchers? Those are horrible!!! As long as they are not rutting they generally don't stink so bad. A rutting boar will have a strong skunky smell. Sows in heat will have a skunky smell too. I think it's rubbed off on them from the boars doing their piggy back thing. Even pen raised domestic boars will get that smell. That's why they are relieved of their twins early on. There IS a scent gland of sorts on male pigs that female pigs do not have. This is called the preputial diverticulum. Gland is located above the foot on the back of the first joint. An intact boar has a gland that produces a foul smelling discharge. When a male is neutered at an early age, this gland doesn't fully mature and typically doesn't emit the foul smelling discharge for long thereafter, however, in older intact boars, when neutered later in life, this gland has developed and is operational. In order to eliminate the smell, you will also have to eliminate the source. Gradually, the smell usually dissipates quite a bit even without the removal, but if it is mature and functional, your pig will likely always have a "special" scent. In addition to that "scent" gland, there are a few others scattered around the body. But they do not typically cause any issues and should be left alone. You may occasionally see your pig scratching the corner of the eye or around the mouth and this may be a habitual behavior in leaving their scent for others to find. Last edited by muzzlebrake; 04-17-2019 at 06:47 AM.